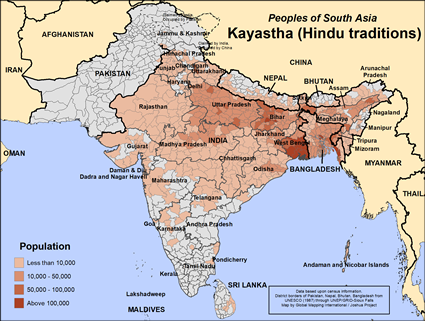 Kayasthas mostly belong to the Hindi-speaking states of West Bengal, Uttar Pradesh, Bihar, Madhya Pradesh and Delhi. Kayasthas also migrated to various other parts of the country. 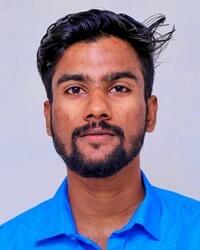 Most of the Kayasthas who shifted to Hyderabad from Delhi and Uttar Pradesh in the middle of the eighteenth century got employment in the court of the Nizam. In 1820, out of the 400 North Indian mansabdars, 60 were Kayasthas. With the passing of time, the Kayasthas have surged ahead. They have broken new grounds in vocations other than those relating to writing and record-keeping, and excelled in them. Thus, in public life, Dr Rajendra Prasad rose to become the first President of the Republic of India, whereas Lal Bahadur Shastri succeeded Jawaharlal Nehru as the Prime Minister. Dr Sampuranand was the Chief Minister of U.P. and Governor of Rajasthan, besides being a literary figure. Jaya Prakash Narain brought down Indira Gandhi, Subhas Chandra Bose fought the British rule militarily. Shanti Swarup Bhatnagar, and Jagdish Chandra Bose were eminent scientists. Munshi Prem Chand, Harivansh Rai Bachchan, Raghupat Sahai "Firaque" Gorakhpuri, Dr Vrindavan Lal Verma, Dr Ram Kumar Verma and Dr Dharm Vir Bharti have been men of letters. Swami Vivekanand was a philosopher and a true Indian. Amitabh Bachchan and Shatrughan Sinha have excelled in the film world, Mukesh and Sonu Nigam in the world of music. It is said that Brahma, the Creator, having established the four varnas "Brahmin, Kshatriya, Vaishya and Shudra" dained Dharamraj (also called Yamraj, the god of death) to keep record of the deeds "good and evil" of all life-forms born and yet to be born on the earth, in the heavens above and in the lands below. Dharamraj, however, complained, "O Lord, how can I alone keep record of the deeds of the beings born into 84 lakh yonis (life-forms) in the three worlds?" Brahma then closed his eyes, meditated for a while and lo and behold! there appeared a radiant figure with a quill-pen in one hand and an ink-pot in another. Brahma named him Chittagupta for he was conceived in his cognitive-self (chitta) and he was lying in Him, dormant and secret (gupta). He was born of Brahma's body (kaya) and so the Lord decreed that his progenies be called Kayasthas. He was assigned to work as a minister, to write and record for Dharamraj. Thus, the fifth varna, the Kayastha, came into existence. Some historians hold the view that during the reign of the Mughals, a number of Hindus who were were educated and endowed with sharp intellect attained administrative positions through rapid adaptation to the Persian language and culture of India's new rulers. These influential Hindus got together and formed a new caste known as Kayastha. View Kayastha (Hindu traditions) in all countries.